🌵Running a business in Arizona takes focus, commitment, and an ability to keep cool😎. And, of course, a good dose of inevitable regulatory compliance! This comprehensive guide will set anyone with an Arizona business on the path to meeting their legal requirements around “Sales Tax,” or its funky Arizona cousin, Transaction Privilege Tax. Grab a frosty beverage and get ready for tax help that aims to be hopefully less dry than the Sonoran Desert. Our Arizona Sales Tax Guide will give you the confidence to manage your AZ sales tax questions from beginning to end. If you have any other questions to help you determine your tax sales obligations in Arizona and how to fulfill them, we are here for you. ☐ Do you need to contact the Arizona Department of Revenue ? ☐ Are you unsure if you should call, email, mail, or visit in person? ☐ Do you ever wondered what information to have ready before contacting them? You may contact the Arizona Department of Revenue General Customer Service by phone at 602-255-3381 (International and AZ callers from outside 520/928 can call toll-free 800-352-4090). They also have many other phone lines for different needs or concerns. If you wish to have someone call on behalf of the owners or principles, whomever is calling must have an Arizona Power of Attorney (PDF) active before calling or else they will be wasting their time. Representatives at ADOR will not be authorized to talk to someone unless they have a Power of Attorney established. If you have any more questions, please feel free to contact us so we can assist you with your sales tax needs. The first thing to say about Sales Tax in Arizona is the most surprising and confusing: that there is no such thing! Say whaaat? Ok, article over, thanks for coming everybody…. :) If only! Arizona also has a use tax for purchases made from entities operating outside of the state: Arizona purchasers buying from out-of-state retailers not collecting use tax must register with the department as must any out-of-state vendors who make recurring sales into Arizona. If you have a TPT license, you do not need a separate use tax license. The process for applying for either is fairly painless, though there is some variability depending on how many locations your business has and where they are located, as we’ll get into below. We are going to detail the steps below so you are ready to register for your TPT License. How do I register to collect sales tax in Arizona? New businesses may apply or register for an Arizona TPT License by visiting the Arizona Department of Revenue and following the instructions provided. As an alternative to registering online, you may also register in person in one of Arizona Department of Revenue’s three offices, or via good old fashioned snail mail. For the latter two options, you’ll need to download and fill out form JT-1 (PDF) which serves whether a use tax license or TPT license is needed..
After submitting, your application will be processed and evaluated by the Arizona Department of Revenue. If approved, they will mail your TPT License to you at the address you provided. The turnaround time, irrespective of the method of submission, is anywhere from three to five business days. Remember: You cannot legally make any taxable sales until you have received your TPT License. What if my business has multiple locations? If you have a business that spans multiple locations, Arizona lets you choose between obtaining a license for each and reporting separately, or having a single consolidated license and reporting aggregate sales. If opting to have a separate license per location, the fee for each is $12 each as opposed to $12 once for a consolidated license. If the ownership is the same, the locations can be consolidated under one license number to permit filing a single return. What is needed if you open a new business location in Arizona? State forty-eight makes this fairly easy! You should already be a registered vendor on the AZTaxes.gov site if needing to add a location. Any time you want to add a new location to an existing business you may do so through the AZTaxes.gov portal. Each new business location added will incur a $12 fee for processing the new TPT license, with the standard three to five business days for processing. What information do I need to register for an Arizona TPT License? Don’t forget! Preparation is key. When you have all this information ready, you can go online and register for your TPT License at the ADOR AZ Taxes website. How much does it cost to register for an Arizona Transaction Privilege Tax License? The Fee for a TPT License is $12. This is per location, unless opting to file a multiple location entity under a single TPT license, which is allowed. There is no fee for a use tax license. Do I need a Federal Tax ID Number or EIN to register for an Arizona TPT License? Absolutely, unless you are registering as a sole proprietor in which case you may opt to use your Social Security Number. You can easily register for a Federal EIN here. I promise that it will be the least stressful encounter with the IRS; it is quick and easy to apply for an EIN number. Which additional agencies in Arizona might my business need to register with? Or others! This will require some investigation on your end. Since every business is unique, there are different rules, regulations, and laws may apply. We suggest contacting to the Arizona Department of Revenue’s License Compliance Program at their email to verify which additional government agencies you will be required to register with. You are now prepared to register for your TPT License in Arizona. Let’s revisit what we’ve learned! Look into what other agencies you may also have to register with. Registering for your TPT License will be stress free as long as you are prepared. We always recommend organizing all the essential information in a folder, both in hard-copy and saved digitally so it is just a click away. If you have any more questions, do not hesitate to contact your tax professional. By now, you may have communicated with the Arizona Department of Revenue and applied for a TPT License to collect and remit sales taxes in Arizona. At this time, you may have lingering questions, which is common! We’re going to go over some common questions that our clients ask us. We believe these questions will help clarify some of the nuances of taxable goods so you can be confident in fulfilling your tax obligations. What products are considered taxable or not taxable in Arizona? In Arizona, with a few exceptions, businesses pay for the privilege to conduct business based off of gross revenue. Is Arizona an origin or destination sales tax state? Arizona is Destination-Based Tax State. As such, you need to charge sales taxes based on where the buyer is located. If Arizona was an Origin-Based Sales Tax state, you would charge based on where you were located. Protip: Charge Arizona sales tax based on the location of the buyer. Based on the location of the buyer, you want to make sure you correctly charge sales taxes in your point of sale or eCommerce software. Otherwise, you risk under or over collecting. 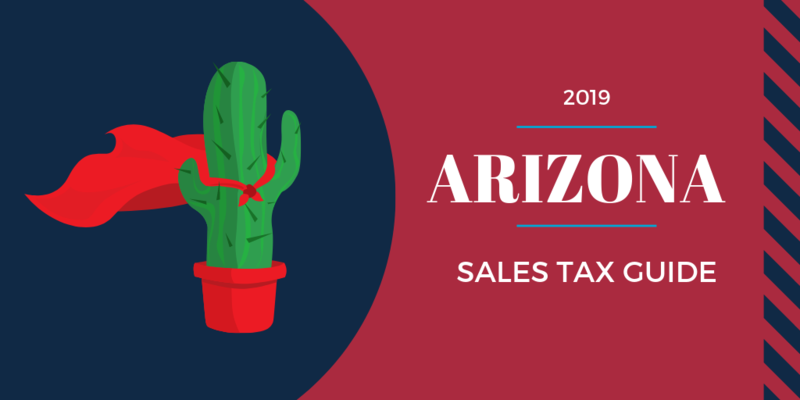 What creates sales tax nexus in Arizona? Let’s delve into the odd case of whether your goods are stored such as in the instance of an Amazon warehouse. Does Amazon have fulfillment centers in Arizona? Yes! This means that if you sell products via Amazon FBA (Fulfillment by Amazon), your products may end up on a shelf in Arizona. Therefore, you may possibly be creating Transaction Privilege Tax Nexus with Arizona resulting from selling your products through Amazon FBA. At Accountingprose we’re here as expert guides for our customers needing to navigate Amazon FBA tax implications. We often suggest using A2X and Wherestock to identify where our clients' inventory is currently being held and shipped from so that we can keep them in compliance. Does Arizona have click-through nexus? Nope! No need to worry about click-through nexus affecting affiliate sales. Is Arizona a streamlined sales tax state? At this time Arizona doesn’t conform to the streamlined sales tax. If you are a business who has established a nexus with Arizona, you are required to collect sales tax in Arizona. Knowing this is just half the battle. Now, We are going to help you navigate the process of how to go about that. In fact, We are going to review some common questions our clients have ask regarding their Arizona sales tax obligations. How do I collect Arizona sales tax? Who is eligible for Arizona Sales Tax Exemptions? What should I do if my customer is exempt from sales tax in Arizona? What happens if I lose an Arizona sales tax exemption certificate? After reading this, you will be better equipped to collect sales taxes. Remember when we said that Arizona is a Destination-Based and a Transaction Privilege Tax State? This means your business pays for the privilege of conducting business in Arizona, based on the revenue received. No need to collect taxes based on transactions; purely the location of the purchase. Your eCommerce software should be able to calculate this for you on the fly. What are the current Arizona sales tax rates? Since Tax Rates change frequently, we will refer you to the Arizona Department of Revenue Tax Rates site. It always has the latest rates (PDF). It’s important to ensure you’re paying the proper tax rates, as the business is liable for paying the privilege tax on all non exempt revenue. What is exempt from Arizona Transaction Privilege tax? sales of prescription and nonprescription medicines. As a business owner, you will most likely have a buyer who qualifies for a sales tax exemption. It is up to you to collect a Arizona TPT exemption certificate (Form 5000) at the point of sale and to keep it on file. As a buyer, you should only accept the certificate if you have no reason to believe it is a fake. Failure to produce the tax exemption certificate may result in the outstanding tax being passed on to the seller, based on the ordinary care standard which will hold the seller responsible if they failed to collect sales taxes when they knew they should have or if they knew the buyer’s exemption certificate was a fake. Remember, you want to collect and file a copy of the certificate. Such certificates must be produced upon request in the event of an audit to justify tax-exempt sales. If you are audited and cannot produce an exemption certificate for a buyer, you may be held responsible. It is important to keep any provided exemption certificates in the case of an audit. Failure to do so could lead to penalties with interest. Does Arizona have a sales tax holiday? So, we have talked about who you need to collect sales taxes from, whether the goods you are selling are deemed taxable, what goods and services fall under tax exemptions, who is eligible for tax exemption certificates, and the process of collecting sales tax in Arizona state. We cannot emphasize this enough: For three years, keep a copy of any certificates exempting a buyer from sales tax. Being organized and prepared for any potential, hopefully not, audits is the key to managing your tax needs. When is Arizona sales tax due? What are the Arizona sales tax thresholds? What if an Arizona sales tax filing date falls on a weekend or holiday? How do I file an Arizona Sales Tax Return? How do I correct an Arizona sales tax return? What happens if I don’t collect sales tax? What happens if I file or pay my sales tax return late? Do I need to file a return if I don’t collect any sales tax in Arizona? If I close my business, do I need to file a final sales tax return? Does the Arizona Department of Revenue offer a discount for filing on time? By the time you finish reading this, you will feel confident enough to file and pay your Arizona sales tax. You must file and pay your sales tax no later than the 20th day of the month following the period being reported. For example, you will need to pay December sales tax by January 20th to avoid penalties and interest. The AZ Department of Revenue even produces this handy calendar (PDF) including all the due dates for 2019! Now you can be extra ready for tax time. There are three thresholds you need to know about as your business grows. Not sure how to determine your tax filing frequency? You can review your eCommerce or Point of Sale Software to see the volume of sales you have generated. Watch your mail for a letter from the State of Arizona so that you don't miss any deadlines. The deadline is moved to the next business day, typically the Monday following the weekend or the day after the holiday. However, we always suggest filing before the holiday. Let me ask you a question before I answer this one. Are you a business who prepares your own tax returns, uses the computer to do so, and has internet access? If the answer is “Yes, Yes, Yes”, Arizona offers an easy way to file online. Simply head to ADOR’s AZTaxes site and file the TPT-2 form online through the portal. If you get stuck and need a hand, AZ Department of Revenue created this handy guide (PDF) to get through the online filing process. Paper: To amend a previously filed Form TPT‑2, check the “Amended Return” box under the Taxpayer Information section. Complete the return with the corrected numbers only. Do not use negative numbers and do not submit a return with negative numbers to amend a prior period. Include all lines that were present on the original return, even if there are no changes to some lines. Electronic: Amend your original return online and submit payment via EFT (if applicable). If you were required to collect sales taxes (nexus in Arizona and selling taxable goods or services to taxable residents) and failed to do so for whatever reason, you will be held responsible for the tax due. Always collect sales tax at the point of sale. Attempting to collect after the fact will be time consuming and most likely unsuccessful. Protip: You are still responsible for remitting sales taxes even if you failed to collect them. Penalties of up to 25% are assessed on Transaction Privilege Tax returns filed after the prescribed due date. Late filing penalties are computed against the total amount of tax reported on the return, not the total amount of outstanding Transaction Privilege Tax. In the event of an underpayment, taxpayers do not get any credit for tax that was paid on or before the due date.Business that are required to file with EFT but fail to do so may be charged a penalty of 5% of the amount of collected tax not remitted by EFT. Yes, you will need to file a “Zero-Tax” return if you don't have any sales during a taxing period. Yes, you will need to file a “Final Sales Tax” return when you close your business. The Arizona Department of Revenue currently offers a discount of 1% with a maximum of $10,000 and no minimum. Now that we covered all our bases for filing and paying sales taxes in the state of Arizona, you should feel more at ease about the process from root to fruit! Due dates are important. If anything, file and pay your taxes early. There are three payment plans for filing and paying your sales taxes depending on how much you collect in sales tax on average in a month. You can file and pay your taxes electronically or by mail (if you are not required to Web File). If you need to amend a return, you need to do so electronically. If you don’t collect sales tax and you were supposed to, you (not the buyer) is liable to pay the sales tax to the state of Arizona. You will have to pay late fees if you fail to file your tax return on time and/or if you fail to make your tax payment on time. Even if you collect no sales tax, you still need to file a return. You need to file a “Final Sales Tax” when you close your business. Let’s leave the good news for last (even though I know you will remember this). There is a discount for filing your tax return on time. Now, you are ready to file and pay your sales tax in Arizona. If you have any more questions, feel free to contact us. Need more help with Arizona Sales Tax? Please note: This blog is for informational purposes only and the information is accurate as of 04/11/2019 If you want legal advice on sales tax law for your business, please contact a Sales and Use Tax professional. Keep in mind that sales tax regulations and laws are subject to change at any time. While we strive to keep our blog current, this blog may be out date by the time you review it.